One of my favorite ways to start the day is a brisk bike ride to breakfast (I love breakfast sandwiches and wraps – feel free to forward recommendations). One morning this week I headed out to check out the new Roman Candle Baking Co. on Division (five stars – killer granola bowl!). On my approach, the first thing I noticed was no parking staples on the sidewalk. But then I saw the bike parking in the parking lot. 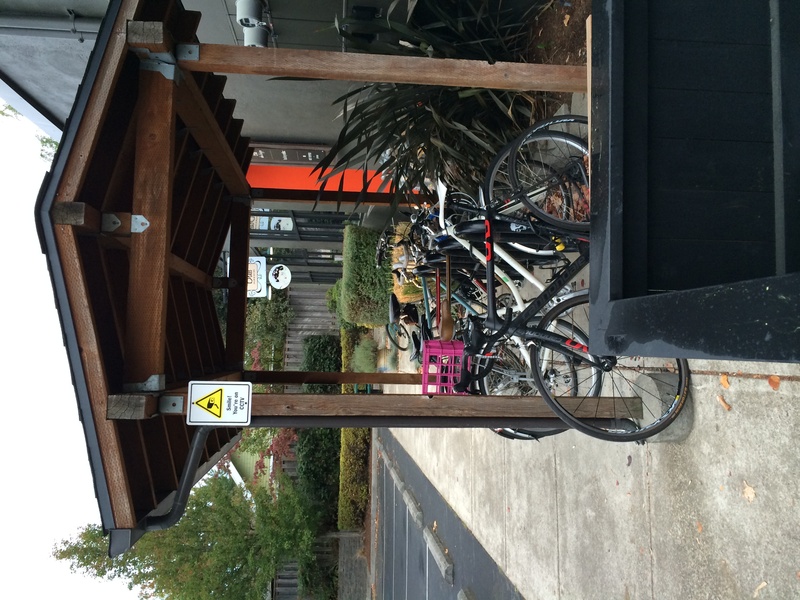 The total bike parking picture was a covered wave rack for five bikes (BTW – wave racks were generally disdained at our wonk night) and another uncovered wave rack for three bikes next to it (where I parked). 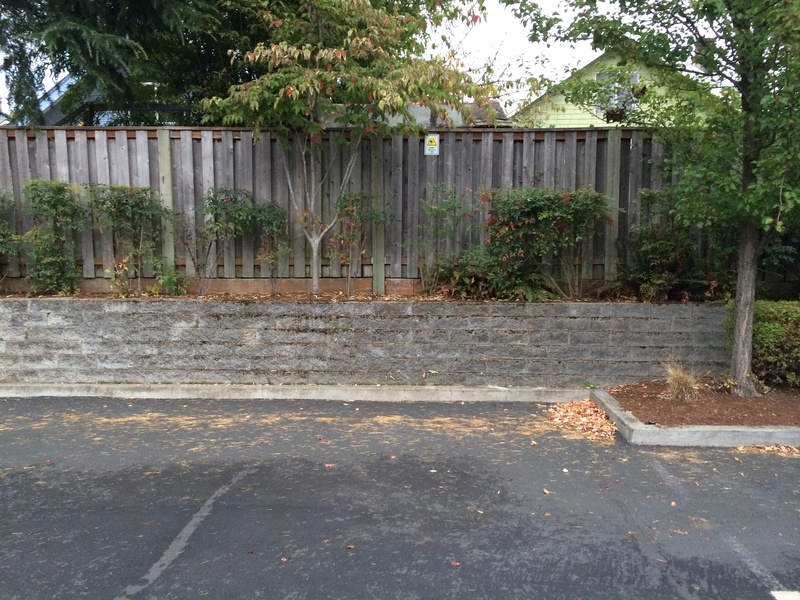 A bit further down, adjacent to the entrance to the next business, there was another uncovered 5-bike wave rack. Here’s the puzzle – at 8am there weren’t enough customers in the bakery to have filled up the covered parking. So either folks not using that particular building are squatting there (tempting), or (more likely – and someone let me know if I’m wrong) the covered parking is being taken up by the employees of the bakery. 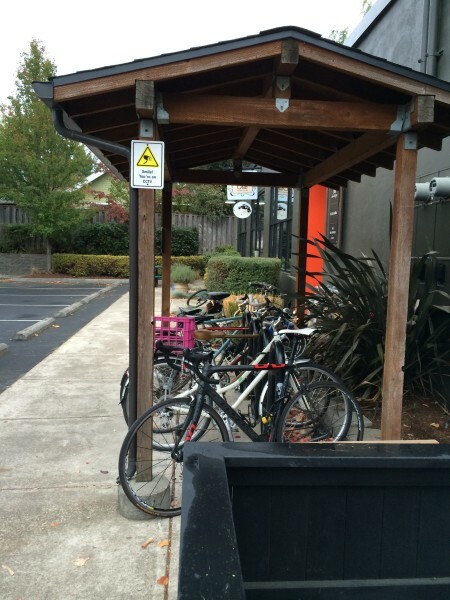 Now I’m not saying employees deserve lower class bike parking (indeed, their security needs may be higher), but this reminds me exactly of the phenomenon I encountered in the auto parking debates in NW Portland. Business owners would complain about a lack of on-street parking for their customers, but would then allow the employees (and sometimes the owner him/herself) to take up the parking spaces near the entrance of the business. It would have been great if ALL the bike parking on the site had been built to the same higher standard. And while I might not want to relegate employees to a lower class of parking, it’s perfectly fair to put employee parking further from the entrance – employees will be there all day, they can walk a little bit. In this case, there’s an area at the back of the parking lot (also under video monitoring) that would be perfect for some covered staples for employees. But if you’re going to be putting premium parking right by your entrance, you really want to manage it for use by customers – that’s just good business! Guest contributor David Brandt is a regular reader. Earlier this year there was discussion on this blog about how TriMet would designate and serve the new Portland-Milwaukie Light Rail line (see “TriMet Confirms That Orange Line Will Go Through Downtown After All, But Details Still Unclear, April 17, 2013″). A clue has recently appeared that might shed some light on TriMet’s plans. At the SW Lincoln St. station still under construction, signage has appeared that would indicated that the station will be served by BOTH orange line trains and yellow line trains. 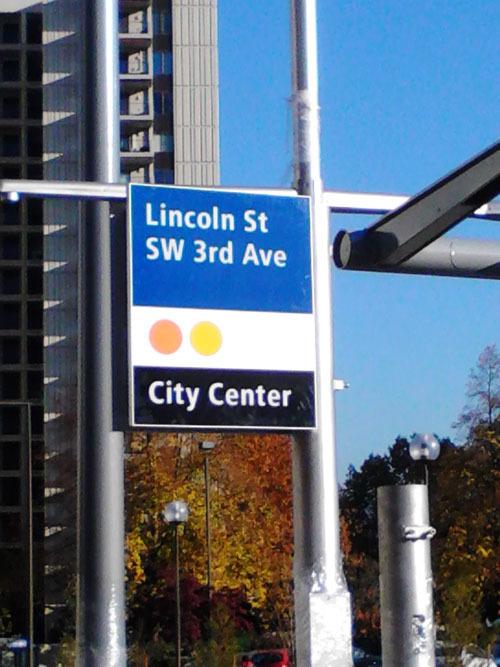 The sign has the station name (SW Lincoln & SW 3rd), line direction for the platform (City Center) and an orange dot and a yellow dot indicating service by two lines. If this is the case, there are some interesting possibilities as to how TriMet might schedule service on the line. One possibility would be for half of the yellow southbound trains to terminate at PSU and the other half to continue south to Milwaukie. Those terminating at PSU could then loop around and become orange trains filling in the other half of the schedule to and from Milwaukie. A variation on this would be for a train to start as yellow at Expo Center, travel through city center and on to Milwaukie, change to orange and travel back to Union Station and returning to Milwaukie as orange, and then finally returning to Expo Center as Yellow. Or maybe they will all operate as yellow trains straight down the line with some changing colors on the southern half as suggested earlier in the year. Any other ideas on what might be up TriMet’s sleeves? Can Google Drive Better than You? They think they can. Based on a paper they presented at a robotics conference recently, they believe their technology already performs better than human drivers. A key approach – avoid dangerous conditions. For example, their software is much better than humans at doing things like maintaining a safe distance from the vehicle in front of you. Speaker: Ted Trepanier, INRIX, Inc. When: Friday, November 1, 2013, 12-1 p.m.
We’ll open with a reminder that our “wonk night” on bicycle parking is tomorrow night!